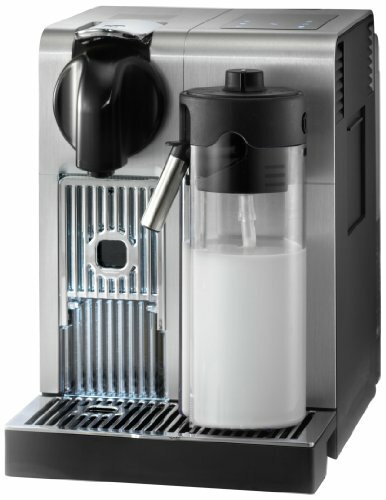 It's never been easier to create authentic Italian espresso based beverages with the De'Longhi Lattissima Pro. Nespresso capsules are designed to take the effort and chance out of traditional espresso brewing and provide easy clean up. The Nespresso capsule system combined with De'Longhi's Automatic Cappuccino System you are only ever ONE TOUCH away from delicious barista style beverages. De'Longhi's Automatic Cappuccino System allows you to design your espresso experience at home, producing the richest, thickest longest lasting foam with the touch of a button. It includes a detachable milk container with auto clean function that produces steamed milk for Latte and frothed milk for Cappuccino and Italian Macchiato. The milk container can be placed in the refrigerator in between uses, so no milk is wasted. Additionally, the Lattissima Pro features an intuitive sensor touch display with 6 pre-programmed drinks; ristretto, espresso, lungo, cappuccino, latte, hot milk and hot water for simple, one touch beverage brewing. The sleek, premium brushed stainless steel die cast body will surely be an eye-catching statement piece on your counter, so show off your one touch barista technique for your friends and family.